Help us protect the icon of the Adirondacks, the common loon. 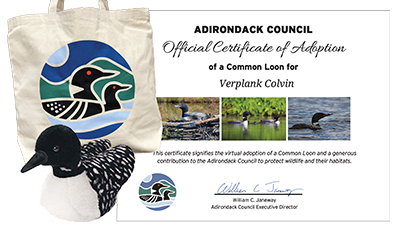 With your adoption, you will receive a plush singing loon toy, a canvas tote bag with the Adirondack Council loon logo, and certificate authenticating your support to protect Adirondack wildlife. The plush toy sings the iconic loon call when squeezed. Suitable for children of all ages.